Learn arts-based tools for facilitating communication, building connection, promoting positive emotions, fostering engagement, reducing stress, and managing the impact of trauma in our inaugural experiential training conference. Choose from 125+ workshops delivered by leading national experts in art, dance, drama, drumming, music, and writing integrated with mental health practices. Scroll down for selected workshop titles. Specialty Tracks: Mindfulness & Wellbeing, Children & Adolescents, Community Building & Social Justice, Expressive Writing & Journaling, Play Therapy, and Special Populations. A convenient selection for Education & Arts Professionals features sessions of particular interest to those in non-clinical settings. What is the Value of the Arts Integrated with Mental Health Practices? Creative expression invites self-reflection and dialogue that can lead to meaningful self-discovery, connection with others, and personal empowerment. Studies have shown that the arts—particularly when integrated with mental health practices—can yield social, emotional, physical and cognitive benefits. The nonverbal aspect of the arts transcends traditional barriers of age, ability, and culture. Shared creative experiences build empathy and community, which expand possibilities for action and transformation. For Whom: Professionals in arts, education, mental health, social services and healthcare, as well as anyone interested in creativity and healing. Continuing Education: Over 30 credits available. When: Thursday, March 30 through Sunday, April 2, 2017. Select any one or combination of days. Where: Hilton Los Angeles Airport. Registration for the upcoming conference on integrative medicine on Saturday, February 27, 2016 is now open. You can reserve a spot here. This year’s ASCIM theme is: “Practical Approaches to Wellness through integrative medicine: Benefits for a lifetime”. Learn more about last year’s conference here. In Summer of 2015, UCLA Center for East-West Medicine will be offering MED180: Introduction to Integrative East-West Medicine for Health and Wellness from June – July 2015 (6 weeks, Tuesdays and Thursdays). 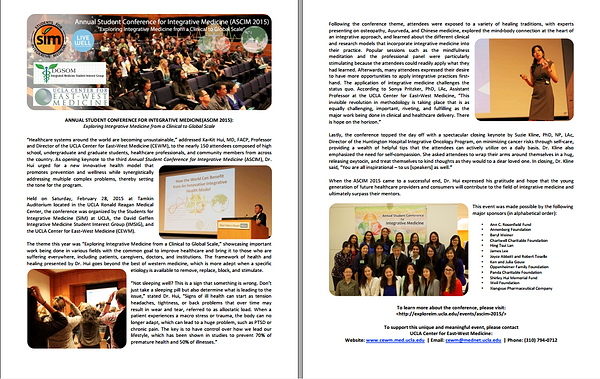 On Saturday, February 28, 2015, students, healthcare professionals, and community members gathered to learn about integrative healthcare at the Annual Student Conference for Integrative Medicine (ASCIM), themed “Exploring Integrative Medicine from a Clinical to Global Scale” at the Tamkin Auditorium, UCLA Ronald Reagan Medical Center. The conference summary report is now available here. UCLArts and Healing presents “transformational stories from integrative veterinary medicine: possibilities for human healing and end-of-life care” on Saturday, February 7, 2015. This event features the bestselling author of Zoobiquity and more. For more information on how to reserve a spot, visit the UCLArts and Healing Programs. Early Student Registration NOW OPEN. $10 with Student I.D. Interested in whole-person medicine? Join 150+ pre-health and professional students from Southern California in learning how a whole-person approach to medicine can address the healthcare needs of the 21st Century. This day-long event will include hands-on workshops demonstrating a biopsychosocial, nutritional, and environmental framework for health cultivation (including Tai Chi, Yoga, Creative Arts Therapy, and Chinese Herbal Medicine), a diverse health professional student panel, and keynote addresses from prominent leaders in integrative healthcare. For more information, visit http://exploreim.ucla.edu/events/ASCIM-2014/. See attached for flyers. For off-campus groups, click here for suggested accommodations. Students for Integrative Medicine (SIM, formerly NCAM) is a student organization at UCLA that provides a forum to learn, experience, share, and explore Integrative Medicine through professional and peer networks. We investigate and promote awareness of different whole medical systems, healthcare systems, and explore ways to maintain a healthy lifestyle. Participate in a UCLA research study of self-acupressure! Perineal self-acupressure has been used by pregnant women to prevent difficulties with labor and by people with constipation to aid in pain-free defecation. However, the technique has not previously been rigorously studied in a randomized, controlled trial for constipation. If you suffer from symptoms of constipation and are eligible, you will be able to receive $50 in compensation for about one hour of your time. You will also receive free education in perineal self-acupressure and standard treatment options. Interested in participating? See the Acupressure Flier or email selfacupressurestudy@gmail.com. invites you to a screening of an award-winning documentary, “The Lulu Sessions”, followed by an exclusive panel discussion on Monday, October 14, 2013 at Tamkin Auditorium, Ronald Reagan UCLA Medical Center.